The idea of painting the Panorama of the Battle of Racławice, a huge canvas measuring 15 × 114m, came from Jan Styka (1858-1925) a well-known artist from Lwów (now Lviv in Ukraine) who invited to a collaboration on this project the excellent painter of battle scenes Wojciech Kossak (18 56-1942). 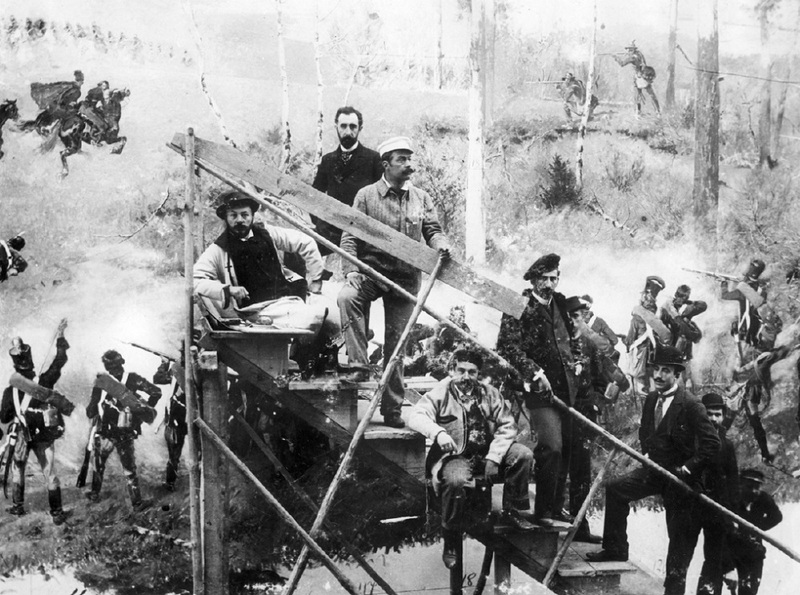 They were assisted in that work by other artists: Ludwig Boller, Tadeusz Popiel, Zygmunt Rozwadowski, , Teodor Axentowicz , Włodzimierz Tetmajer, Wincenty Wodzinowski and Michał Sozański. They wanted mostly to honour the national Polish history on the occasion of the 100th anniversary of the Kościuszko Insurgence – the victorious Battle of Racławice fought on 4 April 1794 by the insurgent army (including the famous troops armed with scythes) led by General Tadeusz Kościuszko (1746-1817) against the Russian army under the command of General Aleksander Tormasow. The ‘heartening’ memory of the battle was of great importance to the Polish nation, at that time deprived of its sovereignty as a result of the partition treaties of 1772-1795. This is why the Great National Exhibition organized in 1894 in the then Lwów provided an ideal opportunity for the Styka project. 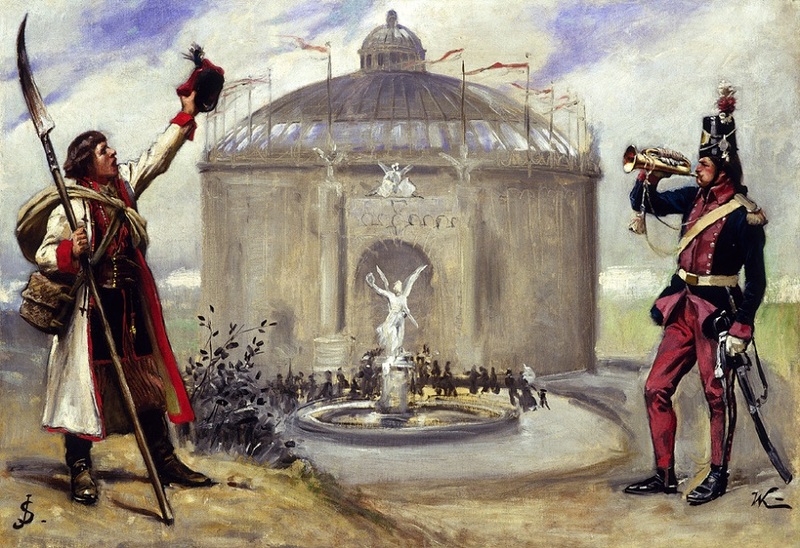 The special canvas was woven to order in Brussels, and the iron construction of the supporting rotunda designed by Ludwik Ramułt was made in Vienna. 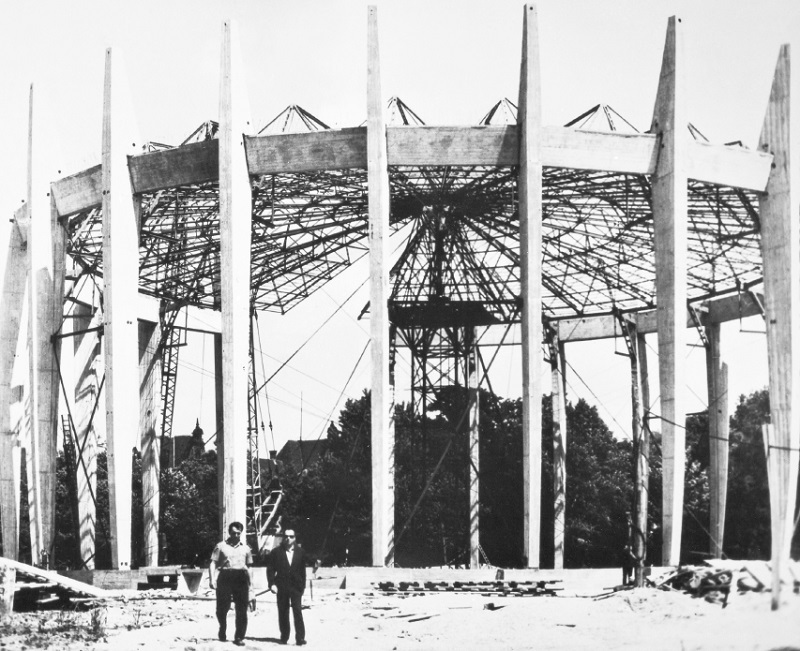 The building to house the rotunda was built in Stryjski Park in Lwów in July 1893. 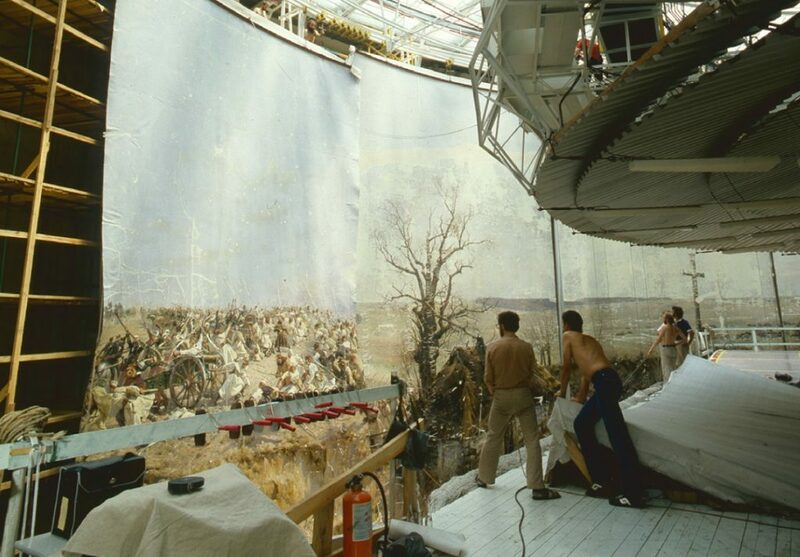 The work on the gigantic canvas was completed in merely 9 months, between July 1893 and May 1894, and the official opening of the Panorama of the Battle of Racławice took place on 5 June 1894. It enjoyed the continuing enormous interest of its visitors and became a star attraction for large numbers of tourists arriving in the city. The painting endured both the war-time odyssey and a tormented post-war period. It survived bombing raids, and quite a few years of hiding in a makeshift wooden crate stuffed with rat poison, until after the Second World War when it was transported to Wrocław together with a part of the Ossolineum collection from Lwów. At that point it became both a bone of contention and a trump card in the hands of top-rank politicians during the complicated post-war period dominated by the Soviet influence, and for many years it was not shown to the public while only undergoing some perfunctory conservation in the only available space like local school gyms. In the meantime a succession of public committees intervened with the authorities in the matter of the appropriate restoration of the painting and its public exhibition, yet its “politically incorrect” subject continued to hamper these efforts. Only with the breakthrough events of August 1980, did the expectations of many Poles become realistic when finally the official consent was given to build a rotunda for displaying the Panorama of the Battle of Racławice in Wrocław. The great canvas painted by Styka and Kossak gave rise to a generous wave of Polish solidarity in collecting funds to provide the painting with a proper home. The official opening of the rotunda, a unique construction built in Jan Evangelista Purkyne Street, which took place on 14 June 1985, at long last created the appropriate conditions for exhibiting the Panorama of the Battle of Racławice in all its glory. It immediately became one of the top attractions of the city and has been drawing a continuous flow of visitors, among them Pope John Paul II, Queen Beatrix of Belgium and the poet Czesław Miłosz.